HUGE game in Strahan Monday night vs. the conference co-leading Arkansas State Red Wolves. This begins a crucial stretch in which the Bobcats play the 3 conference co-leaders in back to back to back games. 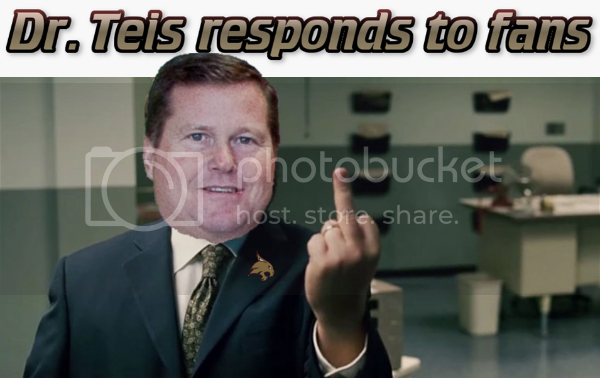 This is Texas State's chance to prove they are contenders for the conference championship. Will they prove they are contenders? Or will they prove to be a middle of the pack team? The only game in San Marcos in this 3 game stretch is this one vs. the Red Wolves. A-State is coming off a loss Saturday in Arlington against UTA. Prior to their loss vs. the Mavs they had won 7 straight. A-State is one of the most surprising teams in the league (as are the bobcats) this year. The Red Wolves were picked to finish 10th after going 7-13 last year, tied for 10th. The difference? Grant McCasland is in his first year as the head coach of the Red Wolves after 5 years as an assistant at Baylor. Although this is McCasland's first D1 gig as a head coach he was very successful at the D2 and JUCO levels at Midwestern State (56-12 record) and Midland College (143-31 record) prior to his time at Baylor. Most that watched A-State the past few years could tell they had talent, but were held back by sub-par coaching. The Red Wolves seemed to have that issue solved this year. The Red Wolves are 9-3 in Sun Belt games and 18-7 overall. They also have a decent RPI mark at 76th in the country and a quality road win early at Georgetown. Their 18 wins this season is already 7 more than the 11 they had all of last year. Easily the most dangerous scoring threat for the Red Wolves is returning senior guard Devin Carter. Carter did it all for the Red Wolves last year, and though he is getting significantly more help this year, he is still the guy to stop for A-State. Carter is a tremendous 3-point shooter who is shooting 40.2% from 3 this season. Over 61% of his field goal attempts are from 3. He is averaging 16.7 PPG and plays over 31 minutes a game. My guess is Bobby Conley is tasked with defending Carter tomorrow night. The 2nd leading scorer, 6-4 guard Deven Simms, comes off the bench as the team's 6th man. Although he doesn't start, he plays over 26 minutes a game. While Carter is the 3-point threat, Simms is at his best penetrating and taking you to the rim. He has the 2nd most FG attempts on the team behind Carter and is shooting just under 50% from the field. My guess here is we put Pearson on Simms when Simms is in the game. 5-11 guard Rashad Lindsey is also a big scoring threat and is even a bigger threat from 3 than Carter. Lindsey is shooting a blistering 44.9% from 3. Obviously this team shoots it really well from outside and we will have to do a better job than we usually do defending the perimeter. Black will probably defend Lindsey simply due to size, though 6-4 guard Donte Thomas runs the point instead of Lindsey. Though Thomas isn't as big a scoring threat as Carter, Simms, or Lindsey he is usually the guy that gets them open looks. Thomas is 15th in the nation in assists per game at 6.0. He has 151 assists on the season. You may have noticed I just listed 4 players, 3 of which are 6-4 and one of which is 5-11. A-State may be even more guard oriented than TXST is this year. They are not a big team and their starting lineup the last two games has actually been 5-11, 6-2, 6-4, 6-4, 6-4. They do have 3 forwards at 6-7, 6-8, and 6-8 that have had starts at the 5 this year, but none have been terribly effective. They've decided to go very small in the last 2 games. I'm not sure if they will continue that against us tomorrow or not. I think a stretch-4 like Tilbury should have the opportunity for a huge game against a team like this. Prijovic may also be able to be more effective than usual. I'd like to see Tilbury/Prijovic try to use their size and look for more interior scoring opportunities than usual. Immanuel King may be asked to have a bigger offensive presence as well, particularly if A-State decides to go small again. We've also toyed with Tilbury, Prijovic, and King all on the floor at the same time recently. We could have a gigantic size advantage if we roll that lineup out at times in this game. The line opened with A-State favored by 1.5 this morning and has stayed there throughout the day so far. Expect a tight game. Tipoff is at 7. Game will also be televised on the Spectrum Sports Channel (Channel 323) if you have Spectrum. Line has swung 2.5 points since yesterday. Bobcats now favored by 1. Also of note, both coaches have the flu as do a few players on each team I'm hearing. big win! way to go cats! GS and GSU lost as well. UTA won so they are alone in first with four teams right behind them. I've waited way too long for basketball to matter. It never has since I was a student in the early 2000s. I gave guys like x and bleedgold credit for still going to games over the years. I went to a lot as a student but Nutt killed my soul. Is this the latest in the season that we have been in legitimate competition for the regular season title (I know that's not a real thing, but I hope you get what I'm saying) since joining the Sun Belt? This has been the kind of game they have lost the last few years. There was a point about half way through the second half where they were able to turn up the intensity. They made a little push to get ahead and were able to hold on. Really nice to see the fans getting in to the game at the end. Really fun game to attend...it was back and forth within a few points the whole game. The students who were there were good and loud but there was half as many as there should have been. I almost didn't go last night after getting home from work late. I missed about the first 10 minutes of the game, but am glad I went. You could tell players on both teams weren't feeling 100%. It was a great game anyway and about as complete a defensive performance as I've seen this season. Interior defense was much better than usual, and *gasp* we actually defended the perimeter a bit. I'm not too surprised by the win. We match up well against AState. As far as competitiveness within conference deep into the season, this is the best I've seen personally in 17 years of actively tracking the team. "Other than crowd size I was happy with everything about the game"
Need to do something to get the students out for these Monday night games. 1,953 is pretty bad considering how well the team is playing this year. ULM had better attendance last night and they are 7-19. Only two games left this season in Strahan. Hopefully somebody can do something to get some people to show up. When I get some time I may research this, but I have a feeling our avg. attendance this year is lower than the last couple years for some reason. Monday night games aren't helping, but it's still troubling. Student turnout, in this case, may be a result of us having been so bad for so long at basketball that it literally isn't on the radar for a lot of students. We have really never experienced meaningful, sustained success in basketball. Plus, Strahan currently is not a good fan experience at all. This team is good enough that the AD needs to throw some strong marketing effort. Loud, visible presence in the Quad, putting it your face everywhere... This team deserves cheeks in the seats, which is the first time I've said that in a long, long time. I'm a "defense first" kind of basketball fan, but I'm the first to say I'm an anomaly in enjoying watching that kind of basketball. Last night was fun, but our brand of basketball isn't always the most exciting thing to watch. That may be a factor as well.